If you are having problems sending and receiving mail, you may need change your authentication method or send and receive ports. In Outlook 2016 and newer with the new simplified accounts dialog, go into Send & Receive settings to view More Settings. You can access this dialog using the Ctrl+Alt+S shortcut or from File, Options, Advanced, Send/Receive button or the Send/Receive menu, Send/Receive Groups, Define Send/Receive Groups. After opening the Send/Receive dialog, Edit, select the account then click Account Properties. Select the account and click Change to open the account settings dialog (or double click on the account). 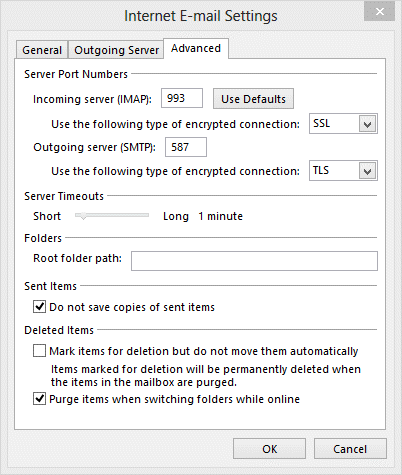 On the Outgoing server tab, select the authentication method used by your SMTP server. Most will use the same as the Incoming server. If you use a server that is associated with a different account, enter the correct username and password on this tab. Change the port numbers and encryption method on the Advanced tab as needed. Note: The screenshot above is the More Settings dialog for an IMAP account in Outlook 2013. The options available vary for POP3 accounts and in older versions of Outlook. Assuming you are using the newest builds, try this: open Send & Receive settings - Ctrl+Alt+S - then click Edit, select the account then Account Properties. Note, you can also access this dialog from File, Options, Advanced, Send/Receive button or the Send/Receive menu, Send/Receive Groups, Define Send/Receive Groups. Are you using two-factor authentication with gmail? If so, you need to use an app password as outlook can't authenticate. If not, are you getting any error messages? My outlook e-mails get stuck in the outbox only with certain wireless networks? If I create a hotspot with my mobile they all fly out no problem! Why is this? Check the outgoing authentication and the port #. See https://www.slipstick.com/outlook/email/send-mail-when-traveling/ for more info. That error is most common when antivirus software is scanning email. Does it work in safe mode? I am getting this error since I updated QuickHeal Antivirus 2013. I disabled-uninstalled and then installed QuickHeal 2014, but the problem could not be resolved at any point of time. Using the "Repair" button and toggling the check mark on "My outgoing server (SMTP) requires authentication" is of no help either. Please assist. Turn off the antivirus add-in in file, options, Addins. I have been working on this issue for 2 weeks. I have done all fixes I can find on Microsoft's website along with your suggestions. I have restarted my computer endless number of times after trying each fix. The error codes are: 0x800CCC0F and 0x800CCC90. There are 3rd party fixes I have found online, though I have avoided using them thinking this could be further trouble. Can you please point me to the fix for this. I am really tired of this and this is an Outlook 2010 problem that may be to be related to an auto update. Please advise. Was an update installed about the time the problem started? If so, which one? Have Comcast isp with Outlook 2003 with a gmail address. I can receive but not send mail. Comcast is absolutely USELESS.This only started today, worked fine yesterday.UGH!!! See messages are stuck in the outbox - comcast changed the outgoing server and you'll need to change the outgoing port.